I moved to the UK back in 1999 and boy were things different here. Well compared to what I was used to anyway. Streets were different, houses were different, days out were different. One of the strangest things I remember the first year of our return, was learning that a trip to the garden centre in England, was not actually just a trip to a garden centre… it was a day out?? Does this happen anywhere else in the world? Or is it just a UK thing I wonder? Honestly, I came to realise that nothing is more exciting than stumbling across a new garden centre and I’m not even any good at gardening. Garden centres to me usually mean… a nice hearty lunch, lots of beautiful plant life, great gift sections and home and garden ware that’s ready to be the envy of all your friends and family. Sorry… wait, I take it back. There is something more exciting than stumbling across a new on. And that is, taking a trip back to an old one! The best ‘old’ one of the lot? Bents. Many, many years ago my dad took my mum to Bents garden centre and ever since my mum has taken countless friends and of course her family to experience the joy of a day out in Bents. A few weeks ago I was invited to the launch of their new Winter Food market, a brand new venture they had decided to embark on after many years of contemplating. For me, no trip to Bents is complete without taking mother in tow, so Mo was left at home that evening and instead Mum and I scheduled some quality time together. It had been a long time since my last visit, thinking back it must have been at least 6 years (at least). When we pulled up into the car park I was literally gobsmacked by the sheer size of it. Was it always this big? Or perhaps the addition of hundreds and thousands of tiny fairy lights made it seem so much grander. We drove into the vast car park and found ourselves walking through the food market entrance. Yes the food market. The last time I visited Bents the food section was quite small. A few counters, few shelves… but now there were fresh patisserie counters, a whole freezer section, fresh fruit and vegetables… and of course no area of Bents is complete without fantastic displays interspersed amongst it all. It was so hard not to spend all our time shopping for groceries, but we wanted to visit the market first before spending time looking around (I had just come straight from work and food was very much required). Heading out into the outdoor garden section, there in the corner sits the new Winter Food Market, a collection of mini huts, picnic tables, outdoor heaters and of course lots of Bents decorating touches. We walked into the evenings private event and took a stroll around the food stalls on offer. When the Christmas Markets come to Manchester, a year can not go by where I don’t indulge in a fresh crepe on a cold evening. So I was glad to hear this market revolved around food. But not just any food, food for everyone. Yes to my pleasant surprise I have finally found a market where I can queue up and order a HOT DOG. You have no idea how good that feels. And yes ok it’s a vegan hot dog, but you know what, it tasted damn good! If vegan hot dog doesn’t take your fancy, there is an incredible pulled mushroom roll you need to buy and try. Truth be told I do not like mushrooms. And yet, here was a sandwich full of them and it was the most delicious thing I’d eaten in a very, very long time! There was a sweets stall with fresh waffles – and crepes and of course one dedicated to drinks. Again, even the hot drink section, instead of just brewing mulled wine like every Christmas market does, there was also a non-alcoholic apple toddy, infused with ginger and cinammon. Oh but you have to try the hot white chocolate – up there with my favourite Slatterys one, thick and creamy but not overly sweet. It was pretty busy that night, tables were full but we spotted a couple of picnic table end seats available and the family on the other side of it invited us to perch and enjoy our meal sat down. We happily accepted, my mum completely drawn in by their beautiful baby girl. As it turned out, they were members of the Bents family. In all my years of coming to Bents, I had no idea this was a homegrown family business. In fact, Bents are celebrating their 80th year and we learned that family is an important part of everything they do. If Mum and I didn’t love Bents before, we certainly have an extra soft spot for it now. The hospitality and friendliness demonstrated not only by the famous family but also the staff on the night really blew us away. There was entertainment playing on the stage in the corner, the lights twinkled, we were surrounded by flowers and plants, there was a lovely atmosphere. The Open Skies Glass House at Bents has one of those magical roof systems, where the panels can open to let in the fresh air, the cool crisp chill of winter. But unlike the markets in town – as soon as the rain decides to fall those panels can close right back up keeping you safe and dry and allow you to crack on with your evening. Before we knew it, closing time was upon us. What we thought would be a quick visit to the markets turned into a whole evening out. Time had flown and it wasn’t long (a week later to be precise) before we were back to properly explore the store and purchase the odds and sods we needed. Return visits are so important, I’ve mentioned before people are always quick to point out to me that I must only receive good service when people know I’m a blogger. Well you know what, if people want to be rude, blogger or not they will be rude. I’m a firm believer that so long as you treat people with respect they will return the favour. And anyway, I can’t ever remember anything BUT good service at Bents, so the fact that we are still receiving it should be of no surprise. It’s so easy to get wrapped up in the happenings of the city, I feel so guilty having neglected places like Bents over the last few years. The opening of the food court is a real game changer, Mo and I recently bought some frozen pastries to cook for guests we had staying over and they were fantastic! Although my top food court tip – Honey dew pomelo fruit is absolutely AMAZING. You will not find a pomelo this beautifully sweet in a normal supermarket, if you find it at all! 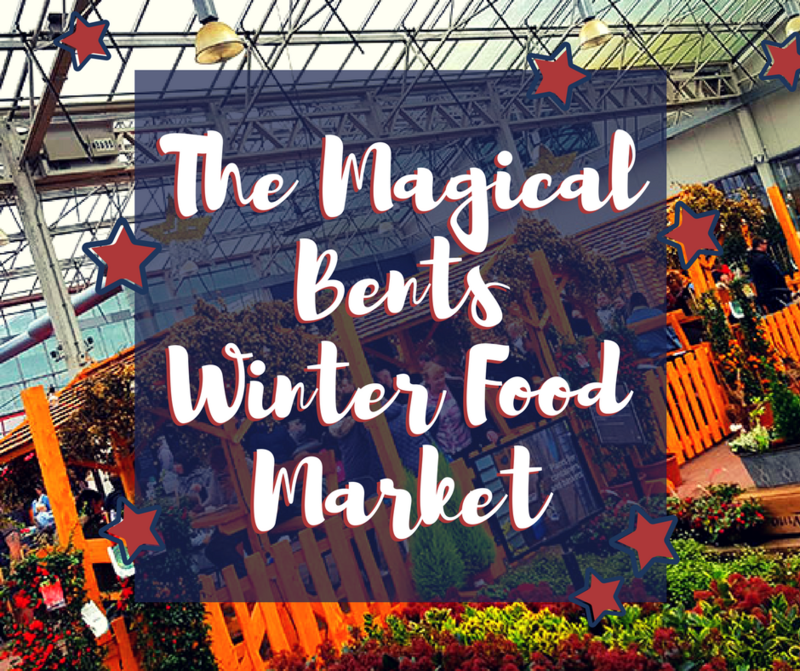 All in all, I’m so glad Bents decided to follow their dreams and finally open this Winter Food Market experience, I think it’s a great addition to the centre and gives us just another reason to return. Fan of Garden centres? Do you treat it as a day trip too? Have you been to Bents? The Winter Food Market is open now until 22nd December.